an easy pick as a Reviewers Choice." Sound "With the LS26 in my system, a brightly lit, wide-open soundstage virtually exploded out of my speakers, bristling with spatial and tonal information. Performers were located precisely in space, surrounded by lots of air." "Good soundstaging usually goes hand in hand with extended high frequencies, and the LS26 certainly enjoyed extended highs." "Another of the LS26s many strong points was an unusually sprightly dynamic performance." "Yeah, I guess you could say that I enjoyed my time with LS26." Features "The LS26 has a hybrid circuit, with a JFET input stage and tube gain stage using the same 6H30 tubes found in the Reference 3. The power supply is fully solid state. The LS26, like its big brother, sports a completely balanced circuit. Every input and output has both balanced (XLR) and unbalanced (RCA) jacks." is spectacularly well designed to show you whats going on within the LS26." "A functional but not fancy plastic unit, the remote control affords total control of the LS26." Value "Although $5995 is not pocket change, the LS26 is one of the best preamps Ive heard at any price, and I am certain it will compete with pricier models from other makers." If theres a single manufacturer thats the poster child for high-end audio, it would be Audio Research. Founded in 1970, Audio Research made equipment that starry-eyed audiophiles like me lusted after and bucked the early stampede toward solid-state equipment by suggesting that, in spite of all the gee-whiz advertising, tubes really did sound better. It didnt take a golden ear to validate Audio Researchs claimed superiority; a simple listen made it obvious. Audio Research currently offers updates to many venerable discontinued products to extend their useful lifespans. Thats incredible support. How many manufacturers would bother to update a 30-year old product? For that matter, how many manufacturers even have a 30-year old product? 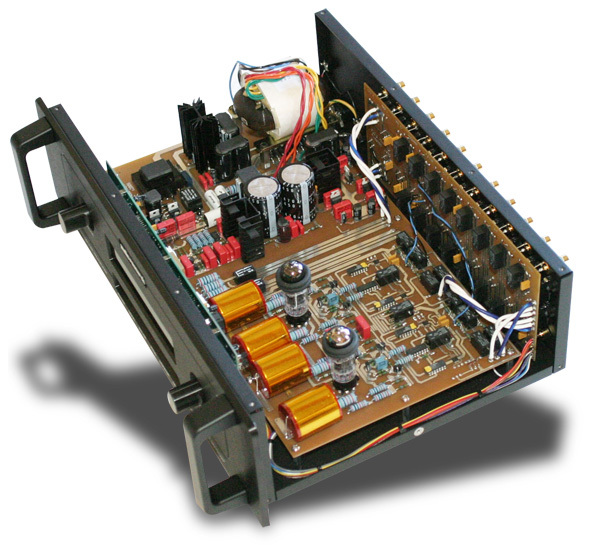 The $5995 USD LS26 occupies the penultimate position in Audio Researchs current preamp lineup. The formidable Reference 3 occupies the top rung, and lots of the technology from it found its way into the LS26. Most obvious is the front-panel display, which is spectacularly well designed to show you whats going on within the LS26. The green vacuum-fluorescent display tells you the volume setting, which ranges in non-linear increments from 0 to 103; the balance setting, adjustable from the remote control; the input selected, also selectable from the remote control; the gain for that input; whether the input uses the balanced or unbalanced connectors; whether the phase is normal or inverted, also controllable from the remote control; and whether the unit is set to play in mono, also controllable from the remote control. Possibly the most intriguing item displayed on the front panel is a timer showing how long the two 6H30 vacuum tubes have been in use. The LS26 has classic Audio Research styling: a 19"-wide black or silver faceplate with rack-mount handles protruding from the faceplate, and a black metal case, 5 1/4" high by 12" deep, vented to permit cooling. The LS26 is surprisingly lightweight -- a svelte 16 pounds. The LS26 has a hybrid circuit, with a JFET input stage and tube gain stage using the same 6H30 tubes found in the Reference 3. The power supply is fully solid state. The LS26, like its big brother, sports a completely balanced circuit. Every input and output has both balanced (XLR) and unbalanced (RCA) jacks. This gave me an opportunity, for the first time after many years of ownership, to hear what my Meridian CD player sounded like through its balanced outputs. And, for the first time, I also heard how my Atma-Sphere S-30 Mk III amplifier sounded with a real balanced connection. A fuse holder makes it easy to replace fuses if required, and an IEC connector lets you use aftermarket power cords should you desire. A preamps basic job is to select an input, set the volume level, and provide enough voltage gain to drive a power amp. Any noise or distortion added, any changes to the character of the sound (which, by definition, is distortion, but not always something we know how to measure) are indications of weaknesses. The LS26s specifications tell us it has few measurable weaknesses. A noise level of just 1.3 microvolts, or 100dB below a 2-volt output, is incredibly low for a tube output stage. Total harmonic distortion plus noise is rated at just 0.01% at 2 volts balanced output. Frequency response is a wide 0.2Hz to 160kHz +0/-3dB at rated output and ruler flat within the audio band. A functional but not fancy plastic unit, the remote control affords total control of the LS26. Some of the preamps features, like setting left-to-right balance, are accessible only through the remote control. The bottom end of the remote is curved, so you could easily orient it even in a very dark room; however, the buttons arent backlit. Input selection is direct; each of the inputs has its own button, which is legibly labeled. So to play a CD, youd press the CD button; to play an LP, youd press the Phono button. Wait a minute -- the LS26 doesnt have a phono stage, so how can it play an LP? Well, perhaps the Phono label is a bit misleading; its actually the input where youd plug in an external phono preamp, like Audio Researchs PH5. Even though the PH5 has only unbalanced output connections, you might expect it would work well with the LS26, and youd be right. The LS26s remote control can spoil you fast. Three levels of gain settings let you match the LS26 to almost any conceivable amplifier. You can even invert the phase of each individual input to see if that improves the sound. You can also dim (eight different brightness levels) or turn off the display entirely. I thought the LS26 sounded a smidgen quieter and cleaner with the display off. Even if you have the display turned off, when you make a change to one of the settings, such as volume level, the display switches back on so you can see the change, then turns off again after a few seconds. Unlike some fancy remote controls, the LS26s was completely intuitive to operate and everything worked just as youd expect it to. I placed the LS26 on the shelf in my rack where my reference preamp normally sits. Audio Research goes out of its way to include a decent power cord with each component, so I used the stock cord. I tried both balanced and unbalanced interconnects. Although Audio Research believes the LS26s balanced connections sound best (and I think theyre right), the unbalanced connections sounded pretty doggoned good to me. In fact, which type of connection sounded best often depended on the interconnects used; unbalanced connections sounded better than balanced if they included superior interconnects. Its hard to compare balanced connections to unbalanced, since balanced outputs have more gain; however, the sound seemed somewhat quieter and just a tad more dynamic with balanced connections. After some experimentation, I used TG Audio High Purity revised balanced interconnects to connect the LS26 to my amplifier and DNM Reson balanced interconnects to connect my CD player to the LS26. Other connections were all unbalanced. I used interconnects from TG Audio, Blue Marble Audio, Crystal Cable, and Purist Audio Design. Audio Research advised that the LS26 needs a minimum of 300 hours break-in, so I waited until that milestone had passed before listening critically. Thanks to the tube timer, it was easy to know when the break-in time had been reached. I continued to hear improvements until the preamp neared 500 hours of use. With the LS26 in my system, a brightly lit, wide-open soundstage virtually exploded out of my speakers, bristling with spatial and tonal information. Performers were located precisely in space, surrounded by lots of air. Most components today produce decent soundstages, but the LS26s is quite special. Arial Ramirezs "Missa Criolla" on the CD of the same name, performed by José Carreras and the Choral Society of Bilbao [Philips 420 955-2], sounded like it was recorded in a huge space with a highly reverberant sonic signature, which it was -- it was recorded in a church. With tenor soloist Carreras spotlighted well in front of the chorus and orchestra, the soundstage stretched both wide and deep, just as the performers were probably arranged in the church. With some preamps, the sound of this CD could be described as an amorphous mush, but the LS26 localized the chorus and orchestra precisely. Good soundstaging usually goes hand in hand with extended high frequencies, and the LS26 certainly enjoyed extended highs. Fortunately, the LS26s treble range was oh, so smooth, totally devoid of any hint of peakiness or edginess. When I played Argentos "For the Angel, Israfel," played by Eiji Oue and the Minnesota Orchestra on Reference Recordings 30th Anniversary Sampler [Reference Recordings RR-908], the very high opening chime was ethereally delicate, but it was easy to hear the entire envelope of sound, from the initial hard transient produced when the chime was struck, through the decay of the note as it hung suspended in space and finally died out. An experienced percussionist could probably tell what brand of chime was used, so great was the detail. Loudspeakers  Opera Audio Consonance M12, Cerwin-Vega CLS-215. Power amplifiers  Atma-Sphere S-30 Mk III stereo amp, Art Audio PX 25 stereo amp, Wright Sound Company WPA3.5 mono amps. Another of the LS26s many strong points was an unusually sprightly dynamic performance. Music sounded very bouncy and energetic. I dont mean that Perry Como sounded like heavy metal, but the music moved forward with great pace and momentum. It just seemed to flow out of the speakers with palpable life and vigor. Sometimes a component will exhibit good dynamic performance in only part of the frequency spectrum, but the LS26s excellent dynamic performance was consistent across the entire spectrum. A dynamic discontinuity means the component sounds different in different parts of the frequency range, and it's just as noticeable as a discontinuity in frequency response. Not so the LS26; its dynamic nimbleness extended from the treble to bass. Although the bass was fast and detailed, it was not overly weighty or deep. I dont mean to say the LS26s bass was weak; when the LS26 drove the monster Cerwin-Vega CLS-215 speakers, it produced very deep bass with all the impact and weight one would expect from two 15" woofers per cabinet. But it didnt overemphasize bass, as some brands of components do to create an immediately favorable impression. If youre looking for a preamp to juice up your systems bass, the LS26 may not be for you. Tube-based components are known for their midrange performance, and the LS26 was no exception. Particularly appealing was the tonality of orchestral instruments, which sounded unusually complete. If you play an instrument, or listen to a lot of live, unamplified music, youll recognize that the LS26 reproduces instruments with great realism. That realism is due not only to tonal accuracy, but also to dynamic accuracy, which further increased the believability of instrumental images. Theres plenty of detail, but its well integrated into the overall soundfield, so it doesnt jump out at you. OK, the LS26 handled musical instruments well, but how did it do with vocals? Those are often harder to get right than instruments. Well, if youre expecting a good grade on vocals, youre right. José Carrerass solo in "Missa Criolla" was reproduced with exceptional detail, so all the many nuances a veteran operatic tenor brings to a piece were easy to hear; yet the LS26 was not even slightly analytical. Similarly, Barbara Bonneys recording of Edvard Griegs "Våren," on the CD Diamonds in the Snow [Decca 466 762-2], was another delight through the LS26. Bonneys radiant, light soprano ranged from very soft to very powerful with no apparent effort, and the LS26 didnt flinch when she poured on the volume. As with Carerrass work, the LS26 revealed all the nuance and inflection Bonney brings to these art songs. Also worth mentioning is Antonio Pappanos piano accompaniment, which ranged from powerful to just a whisper. The LS26 revealed all the extremely soft piano notes clearly, and you should hear how long the closing note hung in the air as it decayed into oblivion. Yeah, I guess you could say that I enjoyed my time with LS26. My $5200 deHavilland Mercury 2 Remote is a more Spartan design than the LS26. Although its remote control regulates volume level and muting, thats it. No fancy display, no tube timer, no balance control. But it does everything I need. The preamp employs a proprietary 32-step remote volume control that uses discrete resistors. Designer Kara Chaffees choice of tubes was, to say the least, unusual; she used type 85 triodes to amplify the signal, followed by 6BL7 triodes as cathode followers to provide a low output impedance. These tubes, long out of production, have an immediacy that I havent heard from other small-signal tubes. A beefy 5AW4 rectifier powers the preamp. My unit uses optional V-Cap capacitors and special switches that provide two different gain settings, somewhat like the LS26s gain settings. The latter is a custom feature to assist me in accommodating the wide variety of input sensitivities for the various power amplifiers I review, which so far have ranged from 0.14 volts (the Manley Mahis) to 2.8 volts (my Atma-Sphere S-30 Mk III) for full power output. After three months of listening exclusively to the LS26, I returned the deHavilland preamp to its accustomed place on my equipment rack. It wasnt hard to distinguish between the two. The deHavillands sound was weighted a bit more toward the lower end of the frequency spectrum, so it sounded mellower. The highs were not quite as extended, and after living with the LS26s treble range, I missed it. The deHavillands sound was more tube-like, which I mean in a good way. Instrumental tonality was even better developed, sounding positively lush at times -- not artificially so, just more vivid and realistic. Soundstaging was also excellent, although not as pinpoint as with the LS26. Dynamics were superb, on par with the LS26's handling, and even better in the lower frequencies. In fact, in my system, the deHavilland preamps weightier low end sounded more realistic. However, replacing a couple of the deHavillands Vishay resistors with similar-value Caddocks restored the highs quite dramatically but may have also reduced the lows a bit. In other words, by swapping only a couple of resistors, I made the deHavilland preamp sound a lot like the LS26. Unfortunately, the resistors were still burning in when the review deadline loomed, so I can only report a possibility that the deHavillands highs may become better than reported here. All in all, the deHavilland Mercury 2 Remote presented an alternate view of the music, and depending on your personal preferences and your systems sound, you might find it preferable to the LS26's. Neither preamp was flawless; the LS26s low end was a bit light in my system, while the deHavillands highs (with Vishay resistors) were a smidgen restrained. The LS26s far more comprehensive features could easily sway many buyers toward it. And if you need or prefer balanced connections, the LS26 is the clear choice, because the deHavilland preamp has no balanced connections, given that its internal circuitry is unbalanced. The LS26s open, detailed, dynamic sound drew me into the music, demanding my full attention. Often when Id put on a CD for casual listening and try to do some reading, Id put down my book so I could devote my full attention to the music. Yet the LS26s presentation was very relaxed and spontaneous, with music flowing naturally out of the system and beguiling me with its great charm. Audio Research has somehow managed to combine two often diametrically opposed goals into a single chassis: The LS26 does all the traditional audiophile things spectacularly well, while at the same time producing music that is both relaxing and involving. Although Audio Research believes the balanced connections sound a bit better than the unbalanced (as do I), you shouldnt rule out using the LS26 with an unbalanced amplifier or source. But if you have a balanced amplifier, the LS26 will probably extract its best sound connected balanced. When a component combines as many excellent performance traits as the LS26, its hard not to gush over it. And in spite of my best attempts to remain objective, its likely youve sensed my great enthusiasm. Although $5995 is not pocket change, the LS26 is one of the best preamps Ive heard at any price, and I am certain it will compete with pricier models from other makers, both of which make it an easy pick as a Reviewers Choice.